Home / Burglar Alarm Installation in York. Call to book your installation. 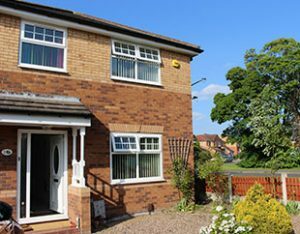 Yale Burglar Alarms are effective, secure, relatively cheap to install and has the ability to be expended easily and managed remotely through their smart phone app. 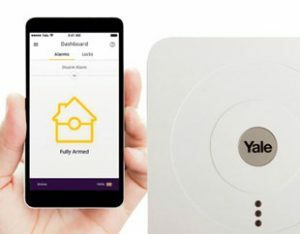 Your Yale Burglar Alarm Installation includes the installation of its components and the system on your smartphone (available of the Yale Smart Home System Only). 60% of burglars say they would be discouraged from targeting a house if they knew it had a home alarm so contact us for a no obligation quote and secure your home today. The EF Series Alarm System – this is a basic but effective alarm system with out all the smart phone options. It is still a comprehensive alarm offering you to dd up to 30 components to the main hub such as door and window sensors, PIR motion detectors, pet friendly PIR motion detectors, Remote Key fobs, Panic Buttons and even smoke detectors. The Smart Home Alarm System – offers all of the above plus Image capturing PIR Motion detectors, PIR Video Camera and smart phone control. 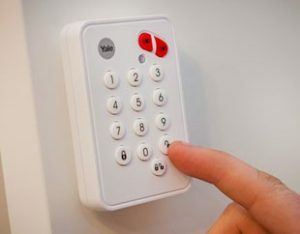 So you can switch on the alarm remotely – even check your home for intruders and view images captured by the detectors. This system does require a broadband connection. Both Yale systems are remotely connected and so there is no need to hard wire each component reducing the costs through time savings on redecoration and running new cable. It is expandable – the system allows you to add more components to expand the security of your home, even including the garage or garden shed if you require. It is a flexible system which can be installed to your budget. 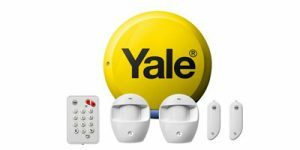 Currently the cost of a basic Yale EF alarm is about £90. An example of the Burglar Alarm Installation we have completed. To see more work, please visit our latest projects pages.